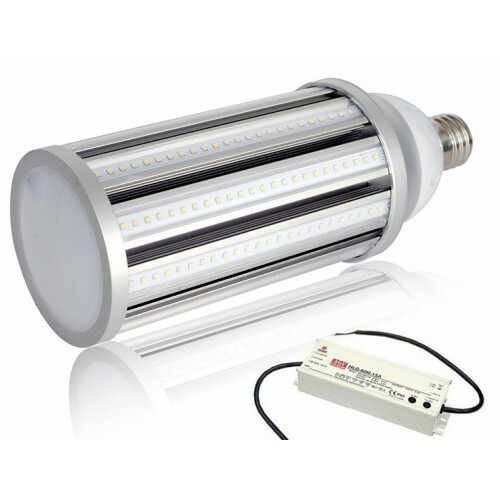 Our "LL E39-100W" is a 100 Watt LED "Corn" type lamp (mogul base) which is a cost effective upgrade for HID, HPS, MH or CFL lamps, useful when the fixture or head does not need replacement. This product is available with an internal driver or the companion Meanwell driver assembly for most efficient choice of installation. 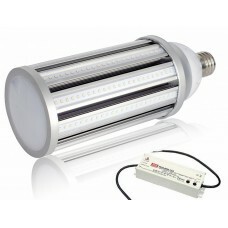 It is the perfect LED retrofit for 400 watt HPS. Diameter x Length / Weight 5.75 x 12.6" / 5 lbs. We tested four (different manufacturer) LED corn retrofit products in a facility parking lot in Scottsdale, Arizona over a two-year span. Our resale product is the top performer of the bunch, and operated flawlessly. Simply contact us for more information or direct ordering information.